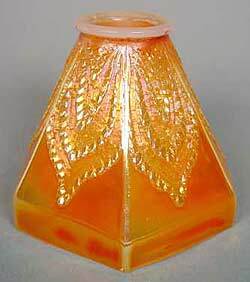 Dragon's Tongue shades are found in marigold on moonstone and displayed nicely on this double-necked desk lamp. This one sold for $275 in 1993; a similar one for $550 in 1995. Four individual shades sold in 1999 for $55 each; single examples for $80 and $90 in 2003. In 2005, the above shade sold for $150 (photo courtesy of Remmen Auctions). 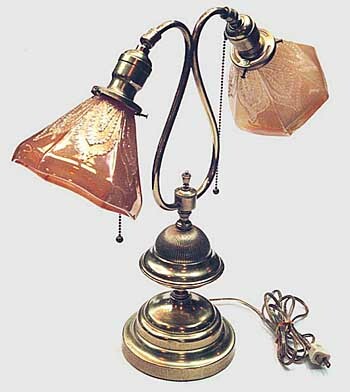 In 2007, a brass lamp with two marigold on moonstone shades sold for $375. The pattern, of course, is also found in bowls. In 2013, a single marigold on moonstone shade sold for $100 and a pair in marigold on moonstone brought $160. In 2017, a marigold on moonstone shade sold for $60 and in 2018, another brought $170.